Art historians, or at least historians of American art, can no longer claim, as Milton Brown did in 1955, that “the total effect of the [First World] war on American art was not great.”1 The last twenty-five years have seen a resurgence of politicized and socially engaged art at the same time that the discipline of art history has expanded to consider a wider field of visual culture. 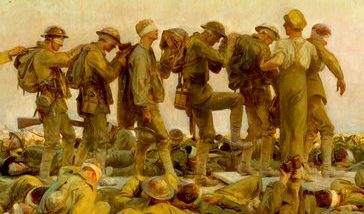 Those converging developments invite current scholarship to resituate American art of a century ago in its political context and to examine overlooked connections between cultural expression and the First World War. 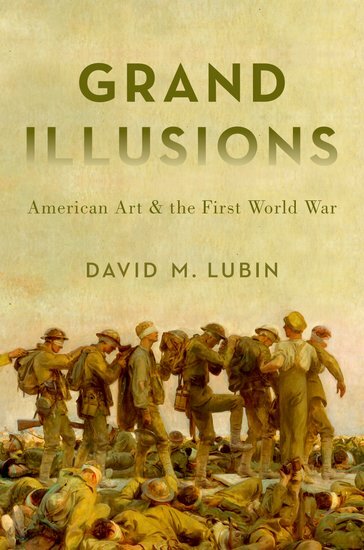 David Lubin, in Grand Illusions: American Art and the First World War, represents an important addition to the growing field of World War I scholarship, and is the first to exclusively focus on the impact of the war on American artists. Together with his 2008 Franklin D. Murphy lectures at the University of Kansas, published in 2015 as Flags and Faces: The Visual Culture of America’s First World War, and the 2016 exhibition, World War I and American Art, that Lubin, along with Robert Cozzolino and Anne Classen Knutsen, cocurated for the Pennsylvania Academy of the Fine Arts, Grand Illusions offers an eye-opening reconsideration of this understudied topic. Literature scholars began to explore the field of World War I visual culture before art historians, due to the elevated status of Lost Generation writers within the literary canon. Scholarship by Steven Trout and Pearl James, for example, expanded beyond the Lost Generation to include marginalized writers and artists.2 On the Battlefields of Memory: The First World War and American Remembrance, 1919–1941, by Trout, from 2010, offers a point of comparison to the new Lubin publication, Grand Illusions. While equally refreshing for the attention they both pay to understudied subjects and popular culture, and for integrating the study of divergent media within the overriding theme of the First World War, Trout’s book specifically focuses on remembrance within the chronological parameters of the book title. Lubin’s book has few parameters, chronological or otherwise, aside from the relationship between World War I and American art. The author addresses everything from recruitment posters to talkies produced in the years leading up to World War II, giving readers a sense of changing American attitudes, from denial and disbelief, and patriotism and pride, to repulsion and disillusionment. There are downsides to the expansiveness of the book, with some chapters displaying less coherence than others. With renewed attention on this period, there is space for more in depth consideration of individual topics. Defying any arbitrary boundaries, this book takes the reader on a wild ride, punctuated by Lubin’s characteristically inspired juxtapositions. One such pairing is James Montgomery Flagg’s 1917 poster, “I Want You” [Uncle Sam Wants You] for the U.S. Army, and Marcel Duchamp’s readymade, Fountain, of the same year. Lubin makes each the linchpin of individual chapters, but not without reproducing them on the same page and drawing readers’ attention to similarities as well as their more obvious differences. The nine chapters of the publication are thematic with a loosely chronological trajectory that begins with early war-related work by American artists who clung to romanticized notions of war and concludes with the lingering emotional impact of the war on the visual culture of the thirties. Chapters in between move back and forth among media (mostly painting, posters, and film) and across high art and low. Chapter 2, “Women in Peril,” focuses on recruitment posters to show how World War I imagery had meanings above and beyond those consciously intended. Just as Chapter 5 resituates Duchamp’s Fountain within its wartime context, Chapter 2 detaches Fred Spear’s 1915 poster, Enlist, from its wartime reading to consider the image alongside changing attitudes about “the public presentation of female bodies.” Enlist, which features a woman clutching a baby to her chest as she sinks to the bottom of the ocean, tapped American fears brought on by the German sinking of the Lusitania. However, Lubin proposes that the drowned woman also “can be seen as a cry of conservative outrage at the threatened sinking of the traditional American family by so-called New Women and their clamor for social and political rights.” (42) This chapter covers everything from debates over bathing apparel to the career of illustrator, Neysa McMein, to show how the war emboldened women to take on newly active roles. As a whole, Grand Illusions is generously illustrated with color images that help the reader make connections highlighted in the text, and this section pairs a photograph of McMein as standard bearer at a suffrage parade in 1917 with a poster she illustrated in 1918, One of the Thousand Y.M.C.A. Girls in France. Readers will appreciate seeing these images of female self-confidence alongside better-known WWI art featuring women as allegories of national purity. Chapter 3 covers the less novel, but no less relevant, subject of war posters that appealed to men’s threatened masculinity and fears of sexual inadequacy. Lubin expertly compares American and British posters, although anyone familiar with representations of masculinity in this period will not be surprised by the conclusions drawn here. Chapter 4 is more unexpected, dealing as it does with different attitudes toward intervention on the home front and how artists expressed their views at a time when fine art shied away from expressing overtly political sentiments. The bulk of the chapter is devoted to Hassam’s Impressionist flag paintings, but Lubin takes the liberty of contrasting the Paul Strand photograph, Wall Street, 1915, with Hassam’s pro-war Early Morning on the Avenue in May 1917 (1917; Addison Gallery of American Art). Throughout Grand Illusions, the author makes disclaimers for such unanticipated comparisons. He admits, “[s]urely few if any viewers would have compared” these works “if only because the audiences for the two images were so unlike.” (96) But by illustrating how Strand’s photograph was a criticism of the war and its powerful Wall Street proponents, he defends the choice of engaging them in dialogue with one another. Lubin’s examination of these images in the context of divided American attitudes toward intervention will add depth to the understanding many readers have of the period. Another lovely pairing is Hassam’s Early Morning on the Avenue in May 1917 and George Bellows’ Cliff Dwellers (1913; Los Angeles County Museum of Art) in which the flags flying over Fifth Avenue in Manhattan in the former recall the laundry hanging from clotheslines above a narrow street on the Lower East Side in the latter. The author uses this visual aid to punctuate his description of differences between the two painters’ art and politics. Chapter 6 tackles a problem at the heart of World War I memory and cultural expression, the unspeakability of the war and resistance to representation. Lubin considers here the painters George Bellows and John Singer Sargent, the photographer Edward Steichen, and the filmmaker D. W. Griffith, strange bedfellows to be sure. What they have in common, aside from the fact that they are all figurative artists, the author asserts, is their effort to overcome the difficulty of visualizing modern warfare. There is no doubt that Sargent’s painting Gassed, (1919; Imperial War Museum, London) deserves a place of honor in the pantheon of World War I art, and Lubin calls it “one of the most complex and multivalent paintings by any artist from any nation to emerge from the cauldron of war.” (160) Although this statement verges on hyperbole, he does not make it without considerable effort to forgive the painting’s “old-fashioned” form and rhetoric. This section nonetheless offers thoughtful discussion of the links between vision, blindness, and war. Chapters 8 and 9, with their respective focus on the beauty obsessed twenties and the traumatized thirties, convincingly examine cultural trends in the context of the residual physical and psychological impact of war. The excellent 2011 exhibition and catalogue, Youth and Beauty: Art of the American Twenties, organized by Teresa Carbone for the Brooklyn Museum, covered some of the themes highlighted here. Lubin makes a case for their recontextualization more pointedly as products of war. He stresses that it was “mutilation” that “drove beautification” and highlights the growth of cosmetic surgery in that decade and the cultural obsession with “plastics” as a consequence of modern warfare.4 (217) However, as the book moves chronologically forward in time, war connections become attenuated. Art historian Sarah Burns uses some of the same artists and films to illustrate her essay, “Death, Decay, and Dystopia: Painting the American Wasteland in the 1930s” for a 2016 exhibition on the art of that decade at the Art Institute of Chicago.5 She attributes the cultural prominence of monsters and death to the rise of fascism, the rise of deaths by automobile, and economic anxiety. After a while, one can imagine certain artwork or movies being put into the service of any number of thematic exhibitions or narratives. By the same token, the section on the Harlem Hellfighters in Chapter 9 might belong just as readily in another chapter. Reading about how photographer James Van Der Zee “domesticated” African American war heroes Henry Johnson and Needham Roberts in his studio portraits, to stave off their representation as “thuggish stereotypes,” stresses just how much more work there is left to recover histories of African American soldiers. Sculptors Sally James Farnham and Augusta Savage, for example, both made sculpture honoring African American veterans about which little has been published. One of the advantages of broad studies, such as Grand Illusions, is that they provide the framework for new research and narratives. In summary, readers will appreciate the breadth of subject matter in Grand Illusions, the inclusion of lesser-known cultural voices, and the eye-opening comparisons that connect themes and artwork in unexpected ways. If big-name artists still ultimately hold a privileged place, at least Grand Illusions positions them as part of a much bigger and more complicated narrative. About the Author(s): Jennifer Wingate is Associate Professor of Fine Arts at St. Francis College.